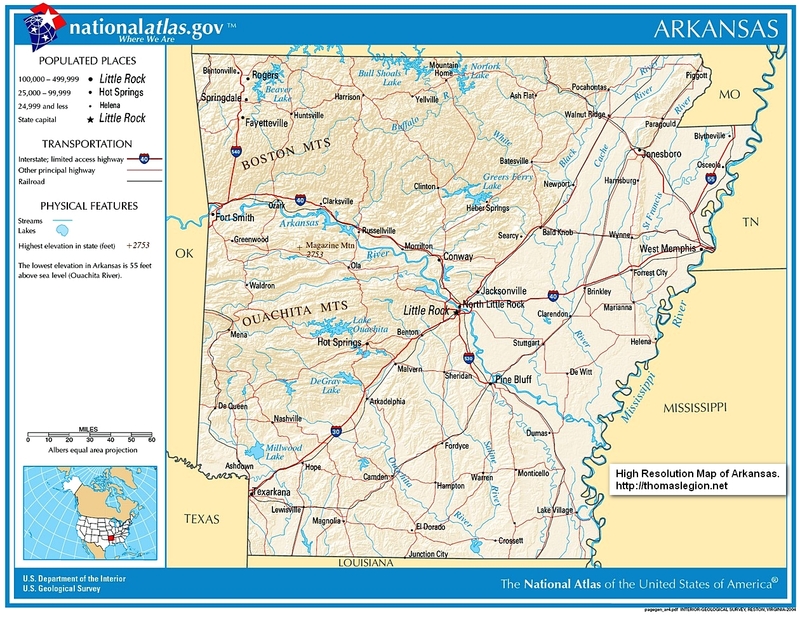 The Territory of Arkansas was admitted to the Union as the 25th U.S. state on June 15, 1836. The history of Arkansas began millennia ago when humans initially crossed into North America. Many tribes used Arkansas as their hunting lands but the main tribe was the Quapaw who settled in Arkansas River delta upon moving south from Illinois. Early French explorers gave the territory its name, a corruption of Akansea, which is a phonetic spelling of the Illinois word for the Quapaw. 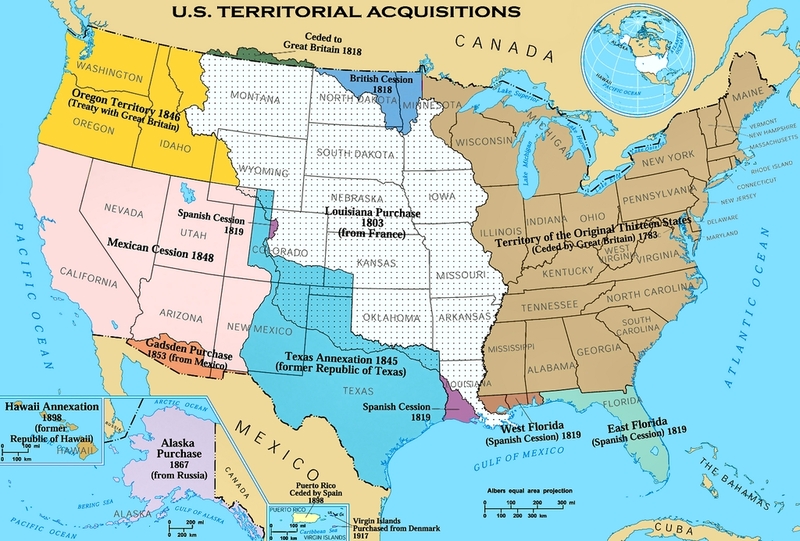 What began as a rough wilderness inhabited by trappers and hunters became incorporated into the United States as part of the Louisiana Purchase in 1803 and became Arkansas Territory in 1819. Upon gaining statehood in 1836, Arkansas began to prosper under a plantation economy that was heavily reliant on slave labor. The first European to reach Arkansas was the Spanish explorer Hernando de Soto, a veteran of Pizarro's conquest of Peru who died near Lake Village on the Mississippi River in 1542 after almost a year traversing the southern part of the state in search of gold and a passage to China. Arkansas is one of several US states formed from the territory purchased from Napoleon Bonaparte in the Louisiana Purchase. The early Spanish or French explorers of the state gave it its name, which is believed to be a phonetic spelling of the Illinois tribe's name for the Quapaw people, who lived downriver from them. Other Native American tribes who lived in Arkansas before moving west were the Quapaw, Caddo, and Osage nations. The Five Civilized Tribes also inhabited Arkansas during its territorial period, but were forced westward under U.S. Indian removal policies. The Five Civilized Tribes were the five Native American nations—the Cherokee, Chickasaw, Choctaw, Creek, and Seminole—that were considered civilized by Anglo-European settlers during the colonial and early federal period because they adopted many of the colonists' customs and had generally good relations with their neighbors. The Territory of Arkansas, aka Arkansas Territory, was organized on July 4, 1819. On June 15, 1836, the state of Arkansas was admitted to the Union as the 25th state and the 13th slave state. Planters settled in the Delta to cultivate cotton; this was the area of the state where most enslaved African Americans were held. Other areas had more subsistence farmers and mixed farming. The Arkansas Territory was created from the portion of the Missouri Territory lying south of a point on the Mississippi River at 36 degrees north latitude running west to the St. Francois River, then followed the river to 36 degrees 30 minutes north latitude, then west to the territorial boundary. This included all of the present state of Oklahoma south of the parallel 36°30' north. The westernmost portion of the territory was removed on November 15, 1824, a second westernmost portion was removed on May 6, 1828, reducing the territory to the extent of the present state of Arkansas. Originally the western border of Missouri was intended to go due south to the Red River. During negotiations with the Choctaw in 1820, however, Andrew Jackson unknowingly ceded more of Arkansas territory. Then in 1824, after further negotiations, the Choctaw agreed to move farther west, but only by "100 paces" of the actual garrison on Belle Point. This resulted in the bend in the common border at Fort Smith, Arkansas. Until Oklahoma received statehood, Fort Smith served as the ostensible legal authority overseeing the Oklahoma Territory. The Army oversaw issues dealing with the Indian Nations. Civil and criminal law was dealt with by court administered Judge Isaac C. Parker who hanged 61 people. The state developed a cotton culture in the east in lands of the Mississippi Delta. This was where enslaved labor was used most extensively, as planters brought with them or imported slaves from the Upper South. On the eve of the American Civil War (1861-1865) in 1860, enslaved African Americans numbered 111,115 people, just over 25% of the state's population. Arkansas did not secede in early 1861 with the gulf states, but it joined the Confederacy after President Abraham Lincoln demanded that the state provide Union troops to help subdue the Southern rebellion following the Fort Sumter, South Carolina, bombardment. Arkansas formally proclaimed its secession from the Union on May 6, 1861. In 1861, Arkansas was a part of the Confederate States of America during the Civil War, and provided a source of troops, supplies, and military and political leaders for the fledgling country. Antebellum Arkansas was still a wilderness in most areas, rural and sparsely populated. 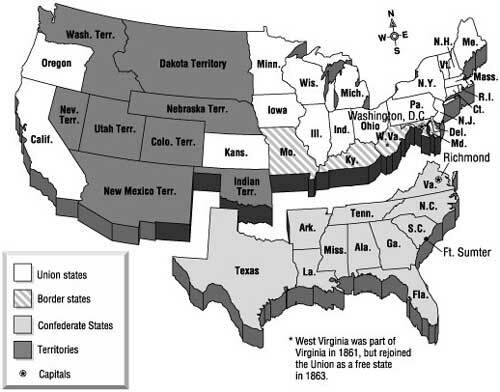 As a result, it did not have early military significance when states began seceding from the Union. State Militia forces seized the Federal Arsenal in Little Rock before Arkansas actually voted to secede. The small Federal garrison was forced to evacuate after a demand by Arkansas Governor Rector that the arsenal be turned over to state authority. At the beginning of 1861, the population and sentiment of Arkansas, like several states of the Upper South, was mixed regarding secession, but it was also opposed to Federal coercion of seceding states. This was shown by the results of state convention referendum in February 1861. The referendum passed, but the majority of the delegates elected were conditional unionist in sympathy, rather than outright secessionist. This changed after the Confederacy attacked Fort Sumter in South Carolina, and President Lincoln called for troops to put down the rebellion. The move toward open war shifted public opinion into the secessionist camp, and Arkansas declared its secession from the Union on May 6, 1861. Support for the Southern cause was great immediately following secession. Many towns sent enthusiastic men with hunting rifles to Little Rock prepared to fight. Citizens across the state thought victory over the lazy Northerners would come swiftly. Some anti-war organizations formed in northwest Arkansas such as the Arkansas Peace Society, but members of these groups were usually arrested and charged with treason or forced to join Confederate ranks. Geographically Arkansas was a very important state during the war, giving the Rebels control of the Mississippi River and tenuous holds on Missouri, Louisiana and Indian Territory to the west. Benjamin McCulloch was ordered to defend north Arkansas and Indian Territory, however quickly went on a bloody offensive resulting in the Battle of Wilson's Creek in Springfield, Missouri with Sterling Price. This bloody battle shocked many Arkansans who thought the war would be a quick and painless victory for the South. Thomas Hindman requested that the Arkansas militia join the Confederate army, but most soldiers threatened to quit if the units were merged. When Arkansas exhausted its supplies to support the militia, the two units were forcibly merged much to this dismay of Arkansan troops. The Battle of Poison Spring took place during the Camden Expedition in south Arkansas in April 1864. The action resulted in a Confederate victory but became marred with scandal after rumors spread that members of the 1st Kansas Colored Volunteers were shot on sight, which was the Confederate policy when dealing with escaped slaves. When Union forces captured Little Rock in 1863, the Confederate government relocated the state capital to the town of Washington in the southwest part of the state. Though Arkansas joined the Confederacy, not all Arkansans supported the Confederate cause. Beginning with the fall of Little Rock to Union forces in 1863, Arkansans supporting the Union formed some eleven infantry regiments, four cavalry regiments, and two artillery batteries to serve in the Union Army. None of those saw any heavy combat actions, and few took part in any major battles. They served mostly as anti-guerrilla forces, patrolling areas that had heavy Confederate guerrilla activity. Another significant event brought on by the fall of Little Rock was the relocation of the state capital. Initially state government officials moved the capital offices to Hot Springs, but it remained there for only a short time, being moved deeper into Confederate occupied territory, in Washington, Arkansas, where it would remain for the rest of the war. According to the 1860 U.S. census, Arkansas had a free population of 324,335 and an additional slave population of 111,115. While Arkansas recruited some 50,000 men for the Confederate Army, it suffered at least 7,000 killed and several thousands more wounded. A total of 8,289 Arkansas men served in the Union Army, according to statisticians Phisterer (1883), Fox (1889) and Dyer (1908), resulting in a total of 1,713 deaths from all causes. Arkansas formed some 48 infantry regiments, numerous cavalry regiments and artillery batteries to serve as part of the Confederate Army. A compilation made from the official rosters of the Confederate Armies as they stood at various battles, and at various dates covering the entire period of the war, shows that Arkansas kept the following number of organizations in almost continuous service in the field: 35 infantry regiments, 12 infantry battalions, 6 cavalry regiments, 2 cavalry battalions, and 15 batteries of light artillery. While overshadowed by the larger and more well-known engagements in the east, Arkansas was the scene of numerous battles and skirmishes during the American Civil War. The 1st Arkansas Mounted Rifles, and the 1st, 4th, and 6th Arkansas Infantries would see considerable action as a part of Major General Braxton Bragg's Army of Tennessee. Including those regiments, all but one infantry regiment and all of the cavalry and artillery units served most of the war in what was known as the "Western Theater", where there were few battles that were on the scale of those in "Eastern Theater". That one infantry regiment, the 3rd Arkansas, served in the East where most of the major battles were fought, for the duration of the war, thus making it the state's most celebrated Confederate military unit. Attached to General Robert E. Lee's Army of Northern Virginia, the 3rd Arkansas would take part in almost every major Eastern battle, including the Battle of Seven Pines, Seven Days Battle, Battle of Harper's Ferry, Battle of Antietam, Battle of Fredericksburg, Battle of Gettysburg, Battle of Chickamauga, Battle of the Wilderness, and the Appomattox Campaign. Arkansans of note during the Civil War include Confederate Maj. Gen. Patrick Cleburne. Considered by many to be one of the most brilliant Confederate division commanders of the war, Cleburne is often referred to as "The Stonewall of the West." Also of note is Maj. Gen. Thomas C. Hindman, a former United States Representative, who commanded Confederate forces at the Battle of Cane Hill and Battle of Prairie Grove. Brigadier General Albert Rust, through his political influence, helped to form the 3rd Arkansas Infantry Regiment, and until his promotion to general commanded that regiment. He later commanded forces at the Battle of Pea Ridge and the Battle of Shiloh, ultimately serving under General Sterling Price. Colonel Van H. Manning took over command of the 3rd Arkansas following Rust's promotion, and was commended for bravery in several engagements, most notably at the Devil's Den during the Battle of Gettysburg. General Earl Van Dorn was dispatched to Arkansas early in 1862 to build a new force. Gen. Van Dorn led his new Army of the Frontier into the Battle of Pea Ridge in late February 1862. This battle was a defeat for southern forces and led to the loss of northwest Arkansas. Immediately following the battle of Pea Ridge, Van Dorn transferred his forces east of the Mississippi River in an attempt to support Confederate Forces in what would become the Battle of Shiloh. Although Van Dorn's force arrived too late to participate in the battle, they remained east of the Mississippi River for the remainder of the war. In April 1862 when Van Dorn left the state, Brig. Gen. Roane refused to go with Van Dorn because Roane believed that Arkansas Troops should be left to defend their state. Van Dorn detached Roane and left him in command of all military forces in Arkansas, but he then did not leave Roane any organized body of troops to command. Gen. Roane approached the Governor of the State, Henry M. Rector, for assistance in raising new forces. Gov. Rector instructed Roane to halt any troops then within the state for the state's defense. There were four companies of the 12th Texas Cavalry at Pine Bluff at the time waiting on a steamboat to take them to Memphis where their Colonel, Parsons, was waiting for them with the two companies of the regiment who were en route to join Van Dorn at Corinth, Mississippi, per Van Dorn's orders. The remainder of the 12th Texas Cavalry were at Little Rock and Benton heading to Pine Bluff for transportation. On May 1, 1862, Rector, believing that Union General Samuel Curtis' army was on the way to capture Little Rock, abandoned Little Rock and moved the state Government to Hot Springs, Arkansas. So for the first three weeks of May 1862 there was no military or State Government at Little Rock. Roane went to Pine Bluff and enlisted the help of Maj. Gen. James Yell commander of the Arkansas State Militia and began recruiting for a new Army of the Southwest in the Department of Arkansas. Gen. Yell was a "States Defense first" advocate and lent his power to aiding Roane along with Arkansas Confederate State Senator Colonel Robert Johnson also of Pine Bluff. These three men were the backbone of the newly reconstituting Army of the Trans Mississippi Department. The companies, which eventually became the 26th Arkansas Infantry Regiment, had started the recruiting process before Van Dorn left the state and had just been organized when Gen. Roane relocated his headquarters to Pine Bluff from Little Rock. Rector in the meantime sent dispatches to President Jefferson Davis threatening to secede from the Confederacy unless he sent some sort of support. Which Davis did in the form of the CSS Ponchartrain and CSS Maurepaus. The State Government did not return to Little Rock until the Ponchartrain arrived and a week later Gen. Thomas C. Hindman arrived to take command from Roane, and ordered all troops at Pine Bluff to Little Rock. Gen. Hindman was dispatched to take command of what had been designated as the Confederate Department of the Trans-Mississippi. Through rigorous enforcement of new Confederate conscription laws, Hindman was able to raise a new army in Arkansas. Union forces threatened the state capitol of Little Rock in the summer of 1862, but settled for occupying the city of Helena and turning it into a major logistical hub. Hindman led his new force, composed largely of conscripts, to defeat in the Battle of Prairie Grove in Northwest Arkansas in February 1863; Hindman was defeated in this attempt to clear northwest Arkansas of Union forces. Hindman next moved his army across the state and attacked the Union supply depot at Helena in an attempt to relieve Federal pressure on Vicksburg, Mississippi. Confederate forces were unsuccessful in this attempt to retake Helena on July 3, 1863. Union forces followed up this victory with a move against the state capitol at Little Rock. 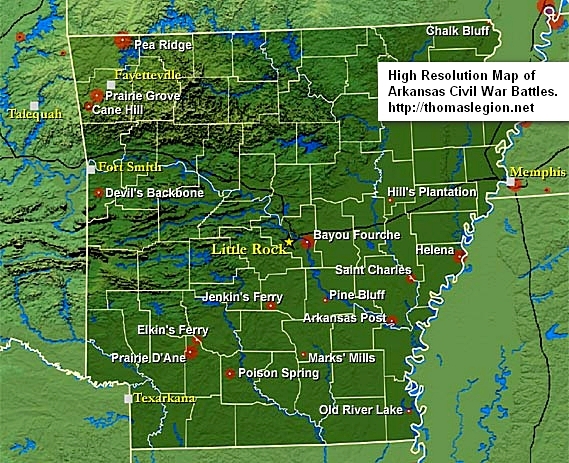 Little Rock fell to Union forces in early September 1863 and Confederate forces retreated to southwestern Arkansas. A new Confederate State Capitol was established at Washington, Arkansas, in Hempstead County. The Union also took possession of Fort Smith, giving Federal forces effective control of the entire length of the Arkansas River. 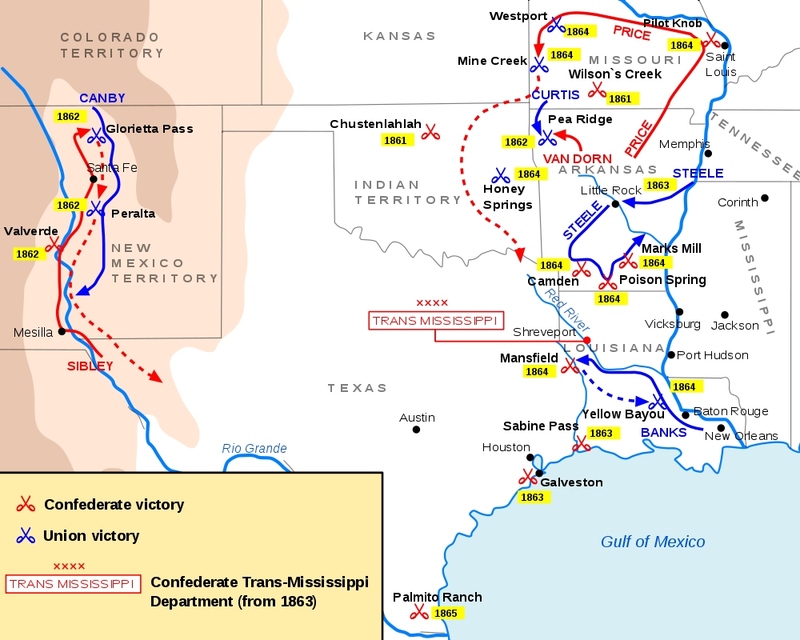 The next major action in Arkansas was the Camden Expedition (March 23– May 2, 1864). Maj. Gen. Frederick Steele and his Union troops stationed at Little Rock and Fort Smith were ordered to march to Shreveport, Louisiana. There, Steele was supposed to link up with a separate Federal amphibious expedition which was advancing up the Red River Valley. The combined Union force was then to strike into Texas. But the two pincers never converged, and Steele's columns suffered terrible losses in a series of battles with Confederates led by Maj. Gen. Sterling Price and Gen. Edmund Kirby Smith at the Battle of Marks' Mills, Battle of Poison Spring and the Battle of Jenkins' Ferry. Ultimately Union forces managed to escape back to Little Rock where they basically remained for the duration of the war. The war devastated the economy and civilian life in Arkansas. As the military action moved out of the trans-Mississippi region, shortages of all manufactured goods and foodstuffs led to widespread privation. By the end of the war, it is estimated that one-eighth of the adult male population (white and African American) had died. The state of Arkansas suffered human and economic devastation that would require years to overcome. Railroads opened up new areas to development and commercial farming throughout Arkansas. Many subsistence farmers were forced into commercial production by their debts, having borrowed against their future crops. The Fort Smith Council was a series of important meetings held at Fort Smith in September 1865 that were organized by the United States government for all Indian tribes east of the Rockies. The purpose was to discuss the future treaties and land allocations following the close of the Civil War. Under the Military Reconstruction Act, Congress readmitted Arkansas in June 1868. The Republican controlled reconstruction legislature established universal male suffrage (though disenfranchising all former Confederates, who were mostly Democrats), a public education system, and passed general issues to improve the state and help more of the population. The state soon came under almost exclusive control of the Radical Republicans, (those who relocated from the North being derided as "carpetbaggers" based on allegations of corruption), and led by Governor Powell Clayton they presided over a time of great upheaval and racial violence in the state between Republican state militia and the Ku Klux Klan. Should the Arkansas state capitol be allowed to fly the Confederate flag? Sources: National Park Service; National Archives; Library of Congress; Official Records of the Union and Confederate Armies; The Union Army; US Census Bureau; Arnold, Morris S. DeBlack, Thomas A.; Sabo III, George; Whayne, Jeannie M. (2002). Arkansas: A narrative history (1st ed.). Fayetteville, Arkansas: The University of Arkansas Press. ISBN 1-55728-724-4; Christ, Mark K. Civil War Arkansas, 1863: The Battle for a State (University of Oklahoma Press, 2010) 3ISBN 978-0-8061-4087-2; Getting Used to Being Shot At: The Spence Family Civil War Letters ISBN 978-1-55728-939-1; Christ, Mark K. Rugged and Sublime: The Civil War in Arkansas (University of Arkansas Press, 1994) ISBN 978-1-55728-357-3; Fletcher, John Gould (1989). Carpenter, Lucas. ed. Arkansas. 2. Fayetteville, Arkansas: University of Arkansas Press. ISBN 1-55728-040-1; Gatewood, Willard B. Whayne, Jeannie (1993). The Arkansas Delta: A Land of Paradox. Fayetteville, Arkansas: University of Arkansas Press. ISBN 1-55728-287-0; Johnson, William R. (Spring 1965). "Prelude to the Missouri Compromise: A New York Congressman's Effort to Exclude Slavery from Arkansas Territory". Arkansas Historical Quarterly (Arkansas Historical Association) 24: 47–66; Mattison, Ray H. (Summer 1957). "Arkansas Post: Its Human Aspects". Arkansas Historical Quarterly (Arkansas Historical Association) 16: 117–138; Moneyhon, Carl H. (Spring 1999). "The Slave Family in Arkansas". Arkansas Historical Quarterly (Arkansas Historical Association) 58: 24–44; Scroggs, Jack B. (Autumn 1961). "Arkansas Statehood: A Study in State and National Political Schism". Arkansas Historical Quarterly (Arkansas Historical Association) 20: 227–244.